I have some exciting news, photos, and places to share, but the first Speakeasy trip is tomorrow, and I want to share that info with the shopping group first. But you will hear all about it on the blog, and from any bloggers who come with us... because no two Speakeasy trips will be exactly the same. That's the joy and mystery of it. So, have you heard of these places? Maybe... What about the tips I'll share about other places? On Friday, March 22, 2013. For those of you planning trips, saving up, or needing time to think, you may plan this date in your schedule! 3PM - 5PM armed with your "Secret Map", you may visit more garment district stores if you wish, and give unique codes (that you'll get from me) to vendors who will give special assistance/discounts. Wanna come? Click below, send payment, and the details on meeting time/place will be provided. From outta town? If you need hotel and/or travel help, I will advise some of the BEST NYC secrets I know! Also, you can click on hotels above (this page - to your right) for the most standard and convenient choices. Payment is only accepted via PayPal (you do not need a Paypal account), credit or debit card. No cash, personal checks, or additional payments will be accepted on the day of the tour. The trip will involve a good amount of walking, so come prepared, and healthy. Spaces remain available, the only Garment District "Speakeasy" tour remaining this calendar year! We all know that there are LOTS of stores in the NYC garment district. And you can get overwhelmed, or far too picky, or indecisive. 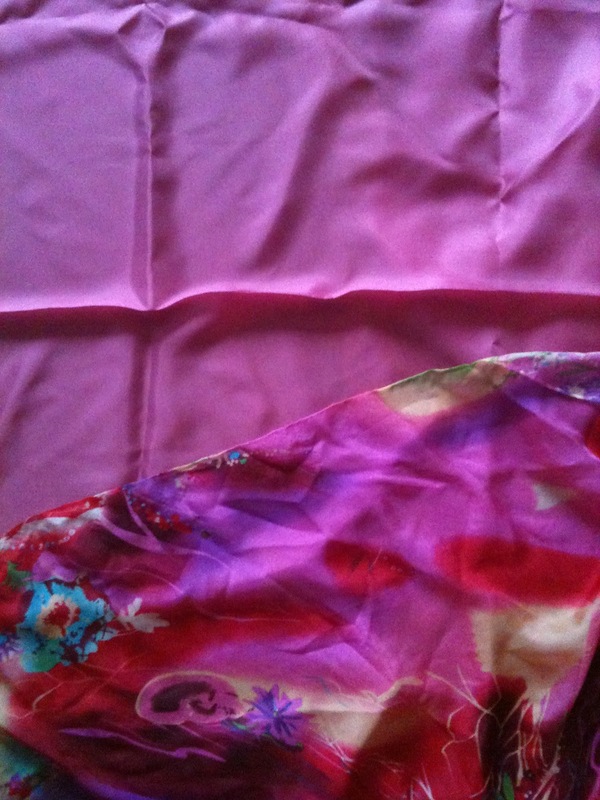 A few years ago, I chose this silk fabric (on top) as a visible lining, to make with this chiffon a bridesmaid was given to use "pop"... Based on just a swatch, the bridesmaid was uncertain, but, trusting my gut, I hand draped and made the dress pictured below. She really loved it, thank goodness. 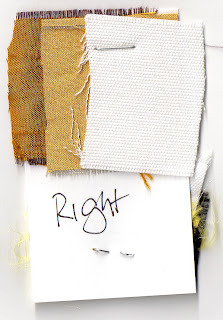 The garment district stores know that you may have to check the budget, match things with other things, get an idea of yardage, get approval, think it over... Those are all good reasons to take a swatch. They also know that the fact that you can swatch may lead you to research endlessly, take swatches to compare, overthink, consult with a million different opinions of others, haggle endlessly with others offering similar goods, and possibly compile an overly optimistic wishlist. When you find a great swatch, attach it to the business card of the store where you found it. Most stores will give you a card to attach it to. Failure to do this will result in a pile of random swatches in your pockets, you will wonder why you collected later on. (Ask me how I know...) Write the price and date you found it. Write the fabric's name and fiber content, if needed. If needed, wash test your swatch (secure it with a safety pin to some other well-worn item in your laundry), burn test it, and/or check it in daylight.When you decide that you do want it, order it, or return to the same store to buy it. When you decide that you do want it, either order it, or return to the SAME STORE to buy it, within a reasonably short amount of time. For the professionals among you, over-swatching can lead to client confusion, and the problem of just TOO MUCH information for a real decision to be made. Fact is, there are plenty of "right" fabrics, plenty of acceptable ones, plenty of wrong ones. Your gut (and experience) will often respond to what will work. Trust it. 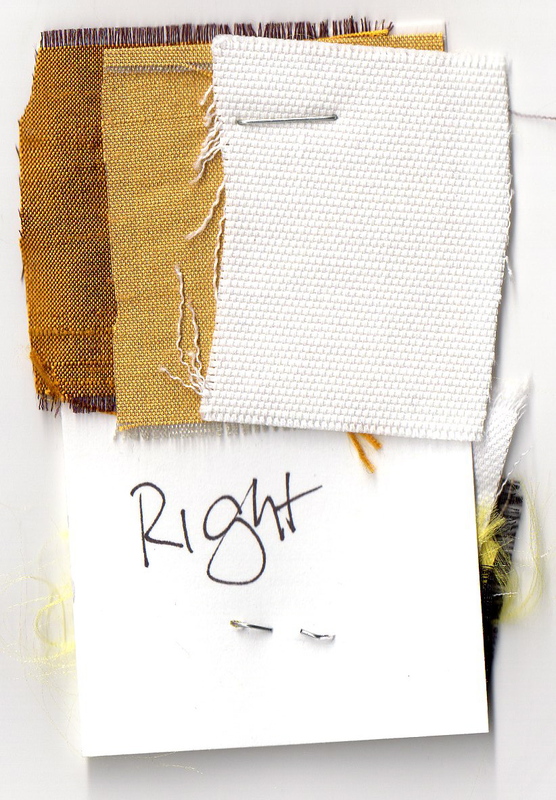 A client gave me a sketch for a costume she designed, and I submitted a bunch of swatches to her, indicating what I felt was a "right" combination of fabrics, and some others, in case she felt differently. She did accept what i chose, and we were both happy with the outcome. Okay, Mood Fabrics is on to something fabulous, here, and perhaps, I'm late to the party, but I totally adore it. They have teamed up with a group of creative sewing bloggers, provide them with fabric, from which they sew a garment, and blog about it. Sew great. Just follow the link here to see the deliciousness. Get ready for the Speakeasy tour! Yesterday, my tour-leading partner, Cindy, and I, walked the tour and talked to the store owners and staff members of the stores we will visit on our tour. Because we are a reasonably large group, we will be dividing up when we visit the smaller stores, so we don't have to climb over one another. There is just so much to see and do that I could truly lead a week-long tour, but for a one day deal, this will certainly be pretty awesome! Better yet, the tour groups is getting such an awesome treat by having Cindy and her VAST knowledge available to us. 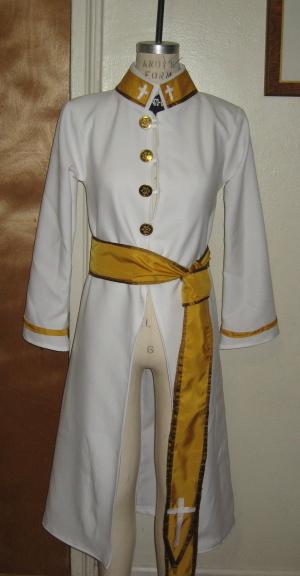 A costume and sewing professional with 40 years experience, she really has SO MUCH experience, patience, and information to share. You guys are really in for a treat! Just an update! The October 20 Shopping tour date has been cancelled, due to VERY few signups, and few inquiries, and the September 28th date is sold out. Only the November 2nd still has spaces available, and that will be the end of the trips I'm offering in 2012. After the holidays, we will look into a spring date as well. Hoping the weather is as beautiful wherever you are as it is here in NYC today! The memory of September 11, 2001 casts a heavy, somber shadow over the city, and today, it seems that the Manhattan crowd is uncharacteristically slow and light. Because I have significant projects to attend to, and things I must get done, I headed into the garment district to run some errands. First off, while muslin shopping, I actually remembered to ask IF and WHERE you can get pinking shears sharpened. The answer to "if" is yes, and it doesn't matter what brand or size. They will do any pair for you at Steinlauf and Stoller. Next, I bought petersham ribbon for a waistband at Pacific Trimming. What is Petersham, and why should you care? The picot (scalloped) edge means it will curve and conform to your body, making it ideal for stabilizing waistlines of curved-waist things (or other curved areas of your garments). Washable and dry cleanable, it has very little shrinkage, and holds its color. Therefore, perfect for some of those garment problems you want to solve or things you want to make. This purchase is for my personal wardrobe. I have steadily lost weight over the years, which made a pair of washed linen pants I love to wear too big in the waist. Now they just look too baggy in general. Since I don't have any more of that fabric, I will reduce the waist and hips, and just remove the current elasticized band, making them a slimmer, smoother, closer fit, which is more appropriate for my body (and fashion) these days. Then I went swatching for brocade at New York Elegant, got distracted by the new goods being delivered, and the general explosion of bolts of fabric the hubbub created, as they moved things around, and found lots that had nothing to do with what I was looking for, while singing along to Gotye on the sound system. Then I found my center, took a deep breath, and went back to my intended task. Boy, do they have some gorgeous stuff. Truly gaspworthy right now. I scanned the fabrics I found, but the scanner just can't convey the magic. Think cotton velvet. Then think metallic cotton corduroy, too. Then think soft, pink cashmere... I found all but the metallic corduroy on the second floor... And, no, I shouldn't be buying any of it before sewing what I've got. Thanks for pointing that out, Partypoopers. A girl can dream, can't she? Below, is a fabric I found that is a faux fur that has a wonderful, almost holographic, metallic feather attitude. So cool and unexpected. Like some sort of fantasy bird/lion's mane. Don't know if this video can convey it, but Ill try. Leather Impact requires you to buzz the bell to get into the store. There may also be an uncomfortably long pause before they let you in. Don't be intimidated by it. No one will give you a hard sell, the third degree, or any kind of "sell" or inquisition at all, it seems. Inside, I went there to get what I need for my furniture project, and got distracted by this stuff... The staff is not a particularly friendly bunch, but they do have some great trims! Large pieces of patchworked leather and suede dangle from the ceiling. Material World has taken down the "We're Closing" signs. Not a mention of them closing now... anywhere. I was there swatching for a client, but didn't find anything that would work. Lotsa pretty things I would personally love to buy, though. Paron had some AWESOME prices today. While singing along (probably a bit too loudly) with the Eagles' "Witchy Woman" on the sound system, I saw LOTS and LOTS of beautiful fabrics with 50% off tags dangling from them, including a pretty perfect brocade for a client. And, truth be told, the full prices were so low, they kinda looked like 50% has been taken off already... but I'm not complaining! Also, a couple of new stores have sprung up recently, and I haven't visited them yet, but we'll save that for another day. I am tired and hungry... I was done by noon. Efficient, or what? Due to VERY light interest in this outing, once posted, I have chosen to cancel it, and will assume those who expressed interest in a weekend day are not ready to commit at this time. If in the future, there is significant interest in such an outing, I will plan another one! Pssst... (lean in, folks) did you know that some of the garment district stores, not normally open on Saturdays, will open for "appointment" shopping? Like... say... if a whole group were coming? For those of you who can't come on the November 2nd Speakeasy tour, or can't break free for a day off during your five-day workweek, have a bit of a journey to Manhattan, have only weekends to shop, and wanna go shopping with your "tribe", there is a SATURDAY shopping trip for you! With me as your guide and host (and special secret-agent-advance-discount-negotiator), we will visit stores open and ready for us because we are coming... You'll have the advantage of personal attention, the camaraderie of peer sewing and design enthusiasts, professional and peer advice, along with a healthy dose of helpful critique/opinion (if needed/desired) while shopping... AND you'll still go to the popular "must-see" stores! This is a walking tour, no trains, buses or cabs involved, so come healthy, and ready to walk! Picture above is not my own (of course). The source is this lively blog. Before really reading the critics' and bloggers' takes on Fashion Week thus far, here are my observations: The collections I've seen indicate to me that, much like Fall/Winter 2012, Spring/Summer 2013 is all about fabric in exciting colors, textures, with creative manipulations and surface embellishments, while the shapes of the garments remain relatively unfussy/uncomplicated. I've seen a number of garments that defy this, but, for the most part, those don't seem to be in the "wearable" category, so we'll just ignore them for now... The fabric is the star of the show, making fabric shopping quite a satisfying adventure right now. The district is bursting with fun stuff, and, if this is indeed the trend that clicks with the masses, you don't have to worry about looking like a circus clown if you join the party! Really now, looking at the pictures above, there are no construction mysteries leaving you wondering how these garments were made, right? And, how cute is that? I have a dangerously similar print lingering in my "someday" pile right now! And Metro Textiles has some pretty great (subtler) patterns, too! And, as exciting as some of the pieces are, really, where am I going in stuff like this? These fabrics give me ideas for more practical and versatile ways to use similar ones, and I know just where to go to get them! 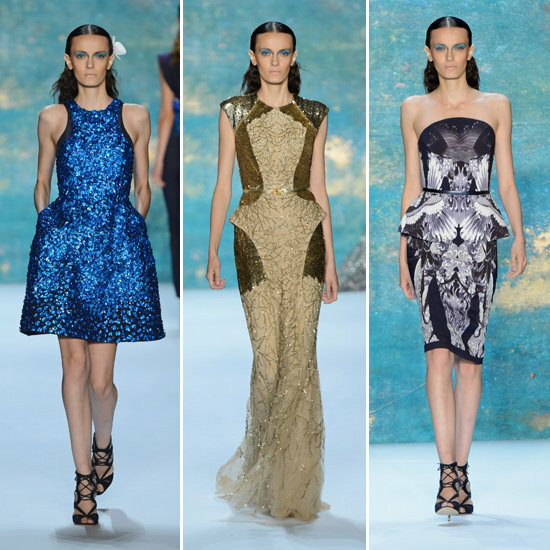 For example, that Monique L'Huillier sparkly blue dress (above) looks great, but, if I were its owner, would hang forever in my closet, garment-bagged, taunting me... possibly making one or two outings before retiring. You know what wouldn't? A great sequined tank or loose rectangular shell, with a tuxedo striped pant and ballet flats or heels. Doable, yes. B&J Fabrics has exactly what I would need to make that happen. NY Fashion Week, its energy, and the relentless media coverage give me insane mojo, and inspiration abounds right now! If you are ready to build your collection of supplies for yourself, your clients, or your own collection, make sure you visit the district soon to start shopping, researching, and making contacts. 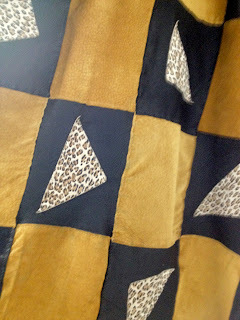 If you are coming with me on my fabric shopping tour on the 28th, (sold out) you are gonna LOVE what you find!!! And... don't believe the trend reports. Seriously. 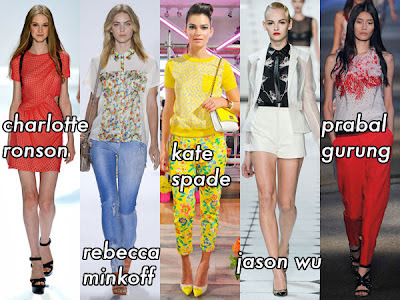 After all, I just spotted this great trend report from Harpers for our current 2012 looks, where Flower-Power, Africa, and Gatsby-inspired looks were highlighted. The Gatsby looks are wonderful, and definitely much more advanced sewing/design work... but I don't see how any of these really manifested themselves on the streets here. I think people are really listening to their own drummers (and wallets) these days. So what inspires you? Music? Art? Fabric? People on the street? Movies/media? Travel? There is just so much to experience and see... Personally, I am really inspired by children right now. Oh, to be a 7 year-old with a healthy fashion budget! I'd really have an amazing wardrobe! To boost your creativity even more, here's a wonderful video highlighting how some designers use music to inspire, influence, and accompany their collections. Notice the designer playlists on the page, and see if any agree with your aesthetic! Where is your mojo level right now? Ready to create? Or ready for a nap? The garment district: Not always for "garments". 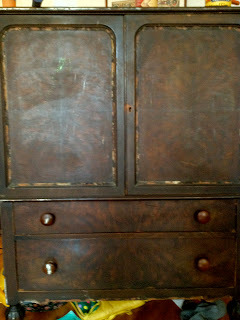 A family friend recently moved, and, in her rush to declutter and free herself of old things she didn't want to have to lift, handle, or dispose of, blasted a desperate Facebook message, asking ANYONE with a sense of urgency to relieve her of some old pieces of furniture. My gut told me to look at what she described only as a "chest", and entrusted my husband with the task of going to take a look, and, if appropriate, bring it home. Trusting that we would want it, based on her apologetic description of this old, sad piece, my husband grabbed my adult nephew, and together, they dragged her back into our home. Oh, the "her" I'm referring to is our new friend. She's not just a chest. I'm sure the more furniture savvy among you know what furniture name to call her, but I named her "Agatha". She is pantry-like, with big sliding drawers on top, deep drawers on the bottom. The configuration seems perfect for storing dishes, silver and table linens, actually, although that's not how we'll use her. She smelled of old basement, had been scraped and neglected, but, even a few hard years could not hide her unmistakeable beauty. 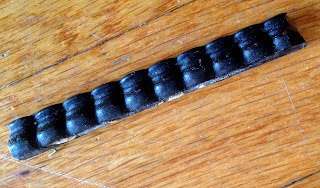 The trim I need to replace. She's a BIG girl! 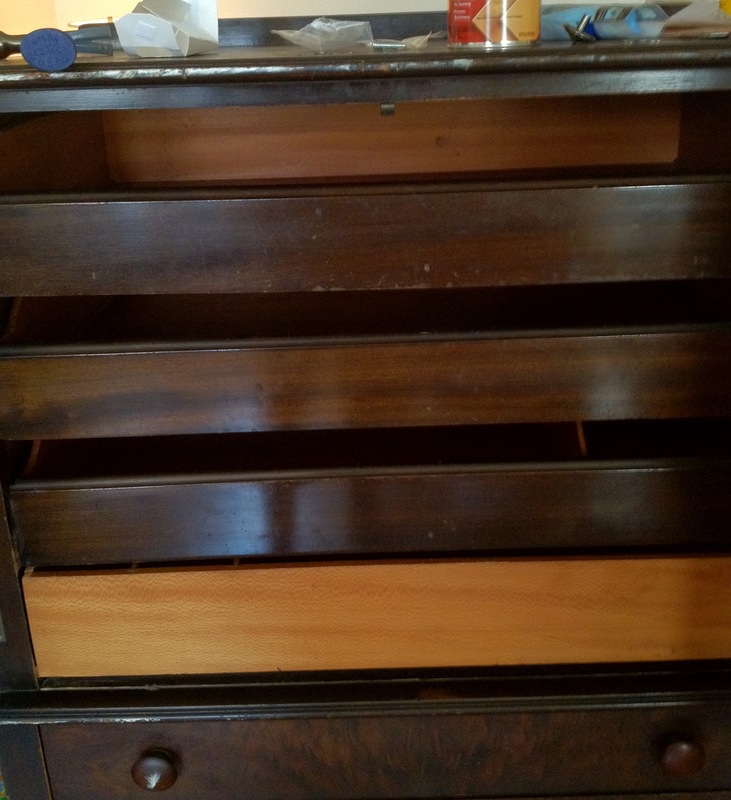 This is the inside - sliding drawers. But she is getting a makeover, and is joining our family. I took a Kaizen approach to her transformation. She needed freshing up. My fabric knowledge told me that she needed a rubdown with a damp vinegar cloth to smell better. Did it, but within a day or so, that old basement-y smell returned. An internet search told me olive oil, warm water and vinegar together would transform her. A much more aggressive, vigourous rub with that solution did the trick. There were a few gouges and scratches that needed a wood filler product. Found that at Home Depot. The wood trim that decorated the doors was crumbling in some places, separating in some places, and needed to be removed. Did that, and plucked out tiny nails with pliers, for what seemed like forever. That trim navigated curves, and fit into grooves on the piece. What to do now? I know! I can replace it with braided leather trim. A few minutes of searching, and I found the trim I need on Leather Impact's website. 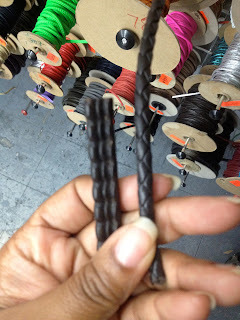 Manhattan Wardrobe Supply has the Barge glue I need, used by shoemakers to permanently attach wood to leather. Agatha's surface needs sanding. 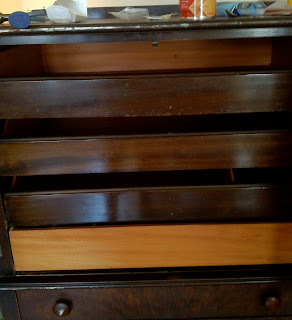 Primer, painting, and drawer liners will bring her back to beautiful, and my friend will wonder why she ever parted with it. A new knob (something button-like?) would be her adorning jewel. My daughter is particularly jazzed by this project, and is helping to transform it. "After" pictures will be posted when we're done!